Experiments in epithelial cells expressing cadherin tagged to a photoconvertible fluropohore for easy tracking, have shown AJs to be highly dynamic structures that continuously turnover cadherin molecules. 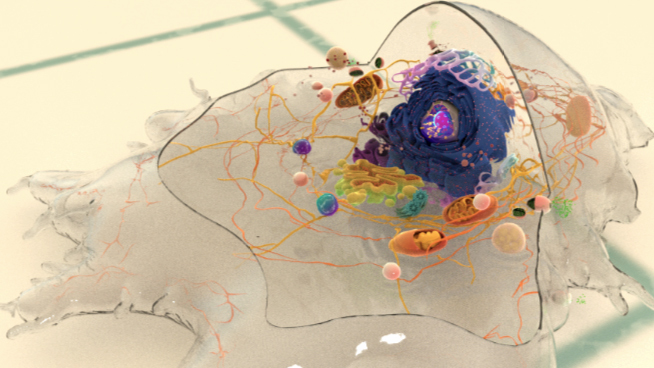 Further investigation using this system resulted in a model whereby cadherins are constantly and spontaneously recruited to the plasma membrane, form lateral catenin-dependent associations and are subsequently released from these clusters in an active, ATP-dependent manner. In this model the formation of a stable AJ is suggested to occur through the inhibition of cadherin release from clusters in the plasma membrane, allowing the accumulation of cadherins at the site of cell-cell contact . Cadherins arrive at the plasma membrane through exocytosis. In epithelial cells, soon after E-cadherin and β-catenin are synthesized and exit the endoplasmic reticulum, these two proteins bind to each other and are trafficked together to the plasma membrane . When two cadherins on apposing cells first meet, binding occurs via their ectodomain (extracellular domain), specifically their outermost EC1 domain (as reviewed in ). This process is calcium dependent, requiring three calcium ions (Ca2+) to bind between each EC repeat. Each calcium binding site is formed from the end of one EC repeat, the subsequent linker region and the start of the next EC repeat. Ca2+ binding results in the regions between each EC repeat adopting a more rigid orientation that causes the length of the ectodomain to adopt a defined curvature . It is this mature, curved form of cadherin that engages in trans interactions. Adapted from . 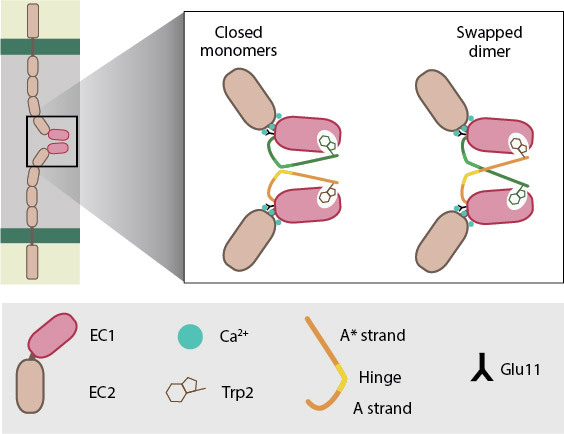 The outermost EC domain (EC1) of cadherins engage in trans interactions by forming a dimer interface. In the closed monomers of cadherin, β-strand A of the EC1 domain is held under conformational strain through anchoring via tryptophan-2 at one end and Ca2+-bound-glutamine-11 at the other end This conformation favors the ‘swapping’ of β-strands on apposing cadherin EC1 domains. In the swapped dimer, the side chain of the conserved tryptophan-2 of one EC1 domain to tucks into the hydrophobic pocket present on the opposing EC1 domain. Trans cadherin interactions result in an adhesive dimer interface between the interacting EC1 domains. Structural analyses show this interface is formed by the ‘swapping’ of β-strand A of one EC1 domain with β-strand A of another EC1 domain, specifically involving the insertion of the conserved tryptophan-2 side chain of one EC1 domain into a hydrophobic pocket of the opposing EC1 domain  (see Figure below). The force driving behind this interface is that of conformational strain, which results from β-strand A of each EC1 domain being strongly anchored by tryptophan-2 at one end and Ca2+-bound- glutamine-11 at the other end. This strain provides the necessary force to flip out the β-strand for ‘swapping’ . Sequence analyses suggest a similar scenario is likely to occur between the EC1 domains of desmosomal cadherins . The role of cis interactions between cadherins is less established, with no clear consensus on precisely which domains are engaged in these interactions (as reviewed in ). Recent evidence however suggests that these interactions are not required to facilitate trans interactions , whereas trans interactions are required in order for cis interactions to occur . Computational modeling has been carried out to determine how these interactions, both trans and cis, result in the formation of a stable junction . These in silico experiments showed that cadherins freely floating in the plasma membrane are not able to successfully form trans dimers unless their diffusion is slowed down in some manner. The introduction of a diffusion trap permitted the formation of trans dimers, however without subsequent cis interactions these trans dimers were unable to coalesce to form an ordered structure. 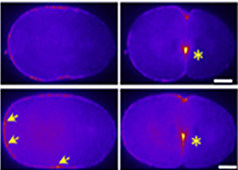 Though weak, cis interactions were nonetheless shown to be vital for junction formation. Moreover, the ordered formation of multiple trans dimers into a junction was shown to be polarized such that each trans dimer had a specific orientation, resulting in the production of a directional lattice . Eph4 mouse mammary epithelial cells plated on glass were treated with blebbistatin (an inhibitor of myosin II) in order to stimulate the release of cell-cell contacts. 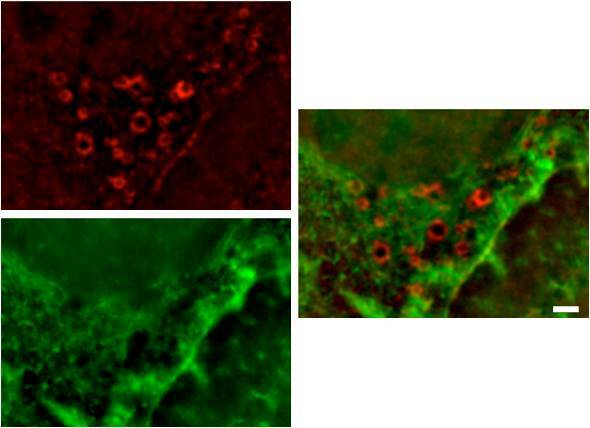 Cells were fixed 15 minutes later and stained for cadherin (red) and actin(green). Merge shown to the right. 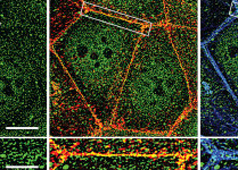 Cadherin can be seen accumulating in vesicle-like structures in the vicinity of the disassembling junction (inferred from the cortical actin denoting the cell edge). (Scale bar 2µm) [Image courtesy of Megha Vaman Rao and Ronen Zaidel-Bar, Mechanobiology Institute, Singapore]. The transition from freely diffusing cadherin monomers and trans dimers to a stable, ordered, 2-dimensional junction comprised solely of cadherin trans dimers is therefore a co-operative process requiring first trans and then cis cadherin interactions. 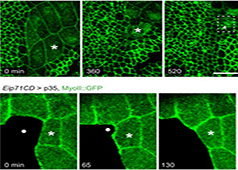 The combination of multiple cis and trans interactions provides strength and structure to adhesion sites. The accumulation of cadherins, in the presence of cell-cell contact stimulates events at the cytoplasmic side of the adhesion site, including reorganisation of the cortical actin cytoskeleton through effectors downstream of Rho GTPases and through linker proteins in complex with nectins and cadherins. Collectively these processes establish the gross architecture of the adherens junction.